Dollar Saving Diva: Cute Summer Bags Under $150! I have to admit, I love a nice leather bag. Pretty much all of the purses I wear/own are leather. But sometimes in the summer, leather bags just feel so heavy and hot! The solution? Fabric or straw bags! Here's my issue though--I have this complex against spending a lot of money on non-leather bags--for whatever reason when I buy something that's made from good leather, I feel like I'm buying something of value. That's not the case when I buy a fabric bag (not to say that I'm right--it's just how I feel). The other issue I encounter is that a lot of fabric/straw bags feel like beach bags. I've found it's pretty hard to find a good, everyday bag that is reasonable but not too beachy. But, they do exist! So on the off chance you're experiencing the same dilemma that I am, I've compiled a little list of some great summery, non-leather, non-beach bags. The best part? They're all under $150! 1. Juicy Couture Peaches Canvas Small Gingham Tote- on sale for $103.60 at Bloomingdales.com. As an added discount, today through Monday, sale items are 15% off with the promo code "SUNNY15," bringing the total to $88.06! I have to say, I'm not normally a fan of Juicy bags, but I think this one is so fun! And definitely summery! Juicy actually has a number of bags that technically fit my criteria, but this is the only one that I really like, so it's the only one you're seeing! If you're interested in seeing other Juicy options, you should check out Bloomie's or any of the other department stores for a pretty big selection of sale items. 2. 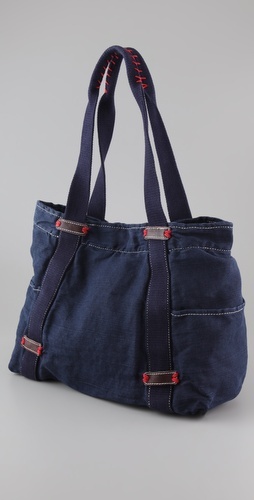 Splendid Solid Canvas Tote (available in Navy and in "Military"-- an olivey green)-- on sale for $89.60 at Shopbop.com. Such an easy and fun tote. You can't go wrong! 4. Anthropologie Roped-In Tote-- $68 at Anthropologie. I never really thought of Anthropologie as a low-priced handbag destination, but I have to say I was pleasantly surprised by the selection online. There are even a few more on the site falling under the $150 mark (and they aren't even sale prices!). I love both of these bags! 6. Tory Burch Jaden Small Tote-- on sale for $149.50 at Nordstrom.com (also available in Navy). Both of these Tory Burch bags are significantly discounted, but are still pretty current, and perfect for the summer! This list is by no means exhaustive, and is pretty much limited to bags that I like, but it should give you a good starting point, and hope that reasonable, non-leather bags really do exist!